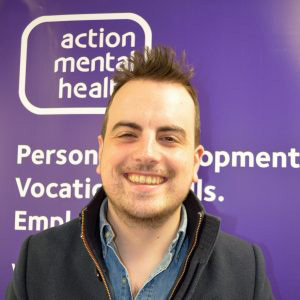 Action Mental Health has teamed up with local experts like Dr Phil Anderson who today – during Children’s Mental Health Week – shares his expertise on creating and maintain Healthy Habits among young people. Regular daily investment in our bodies and minds is often overlooked but yet so important in promoting resilience and good mental health. The promotion of ‘healthy habits’ in childhood can set positive lifestyle foundations and deliver the best results across a lifespan. These healthy habits are often known for their physical health benefits but research has shown their significant benefits for our mental health too. This makes perfect sense in context of how science has shown how deeply and intimately connected our bodies and minds are. This is much so that we should probably talk about promoting good health rather than artificially dividing it into physical and mental health. The three main healthy habits I want to focus on are food, exercise and sleep. ‘Food’ – good nutrition and hydration is probably the least recognised part of healthy lifestyle in promoting resilience and good mental health. However, research is increasingly pointing to the role of good nutrition in brain and emotional health. Our digestive system is intimately interconnected to our brain through what is called the ‘vagus nerve’. A balanced plant based diet with plenty of fibre changes the type of bacteria in our digestive system, which helps send calming signals through the vagus nerve to the brain. These signals then help develop our resilience and emotional health. In comparison, unhealthy diets with lots of processed food and sugar can send stress signals to the brain. Don’t underestimate the importance of ‘fun’ in meal making – music and the [occasional] deserts etc. ‘Exercise’ – the physical health benefits of regular exercise are well understood but its impact on our mental health can be profound too. Physical activity helps release the ‘feel-good’ hormones known as ‘endorphins’ that make us feel instantly better after a run. Physical activity also releases the stress hormones, which we experience when we feel stressed. Regular physical exercise develops our bodies’ ability to manage the stress response better, promoting resilience. This can also be a struggle with some children, particularly when they are hitting early adolescence. The key thing is making it fun and something they enjoy. It also can also be another opportunity for ‘connection space’. ‘Sleep’ – don’t underestimate the importance of good quality sleep in promoting a child’s resilience and emotional health. Sleep is best understood as the time the brain uses to filter out the toxins it has accumulated during the day. Lack of sleep can make everyday life challenges feel so much more stressful. It can negatively impact a child’s concentration, memory and their ability to regulate their impulses and emotions. This can be a real challenge with some children and can impact the whole family if their sleep is disturbed. Often keeping a sleep diary for a child can help identify what the problem is. The other ‘healthy habits’ – food and exercise can have a big impact on sleep. A balanced diet and regular exercise can help promote good quality sleep. Particularly with younger children, encouraging a bed-time routine, including a fixed bed time with a set ‘wind-down’ period with a warm milky drink can help. One of the biggest challenges can be limiting screen time with hand-held devices. The stimulation these devices cause can impact sleep and it can really help by regularly and consistently limiting use during the wind-down period. 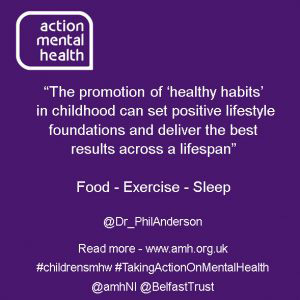 Dr Phil Anderson is back again tomorrow to talk about Parental Self-care.